Toyota People… is a series that celebrates individuals with a special enthusiasm for Toyota, whether that is related to its vehicles, philosophies, or manufacturing processes. 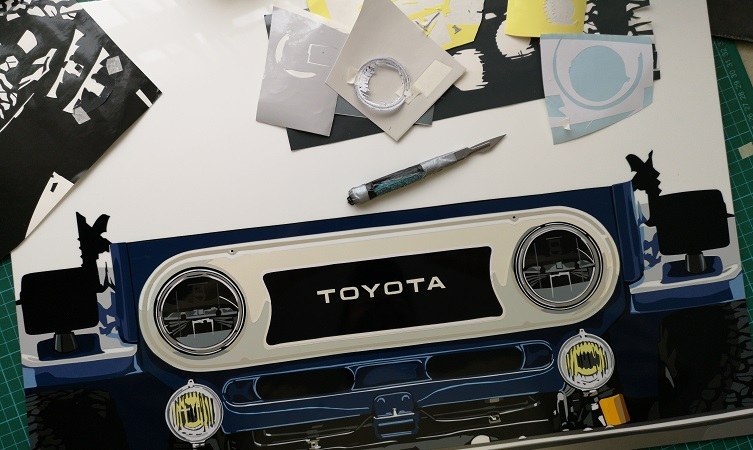 Joel Clark, an artist who works with hand-cut vinyl, doesn’t exclusively create works based upon Toyota models. 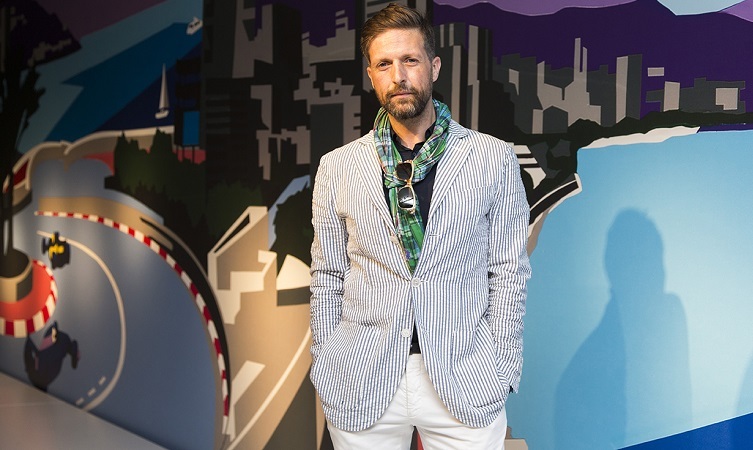 However, the fact that his most recent production was inspired by the iconic FJ40 Land Cruiser is sufficient for him to meet our criteria as a Toyota person. As an added bonus, Clark says he comes from a “Toyota family”. Until recently he owned a Celica, and his father and brother also own Toyotas. 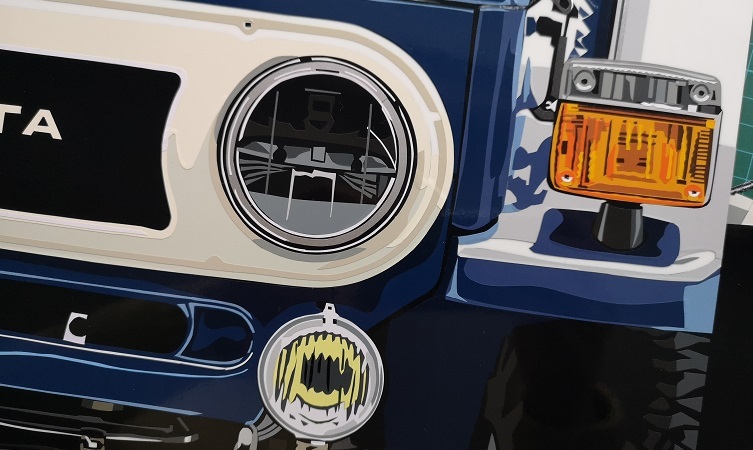 That’s good enough in our book and, as we’ll explain, the FJ40 he’s just finished creating for a client in New York is already proving to be one of his most popular and talked-about works. How did you get started as a hand-cut vinyl artist? Joel: “I am a complete petrolhead and I’ve been drawing cars since I could hold a pencil. When I first left school back in 1990 I did a few months of work at a vinyl sign company based at Silverstone circuit. Back then there were no computer programmes at all to cut anything out, besides standard fonts, which could be done on a plotting machine. Logos such as Dunlop, Shell and Michelin all had to be cut by hand from vinyl. That planted a little seed in my head that only took about 25-odd years to flourish! 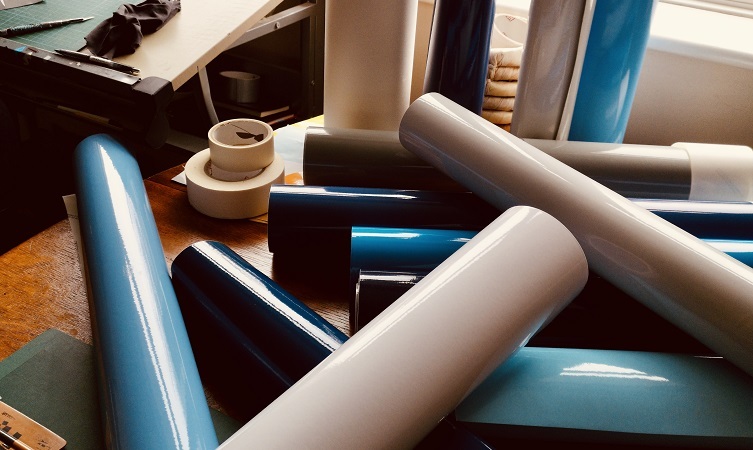 What are the benefits of working with hand-cut vinyl? Joel: “The vinyl has the same finish as the car I’m depicting. No painting can ever get near to that. Once the piece of work is on a wall, it takes on the light of that environment and you get all the reflections which would hit an actual car, in addition to the reflections I’ve included in the art from the original image I’m working from. Does this style of art require any special tools? Joel: “Just a scalpel, a squeegee to stick things down and a wiping cloth – the kind you might get with a pair of sunglasses – to wipe away any fingerprints. That’s it, apart from a drawing desk. I’m strict in that I won’t even use a ruler. People used to ask if the art is created using a computer, but I’m adamant and very clear that this is hand-cut. I will usually include just one line done with a ruler as a little thing in there for me to spot. Joel: “Usually clients will come to me with one of their particular cars in mind or simply a favourite racing car or classic car. I will then source an image of that car. If it is possible, I will go out and photograph the car myself on a day when the light is good. 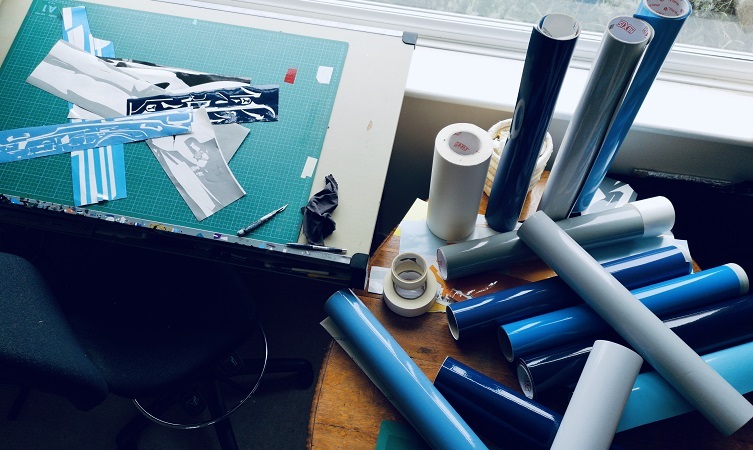 “When an image has been chosen, I will then create enlarged photocopies of it and use those to draw all the sections which I then need to cut out of the vinyl. They are basically my blocks of colour. Then I start putting together the vinyl pieces like a jigsaw or collage. That’s when the image starts to come together. 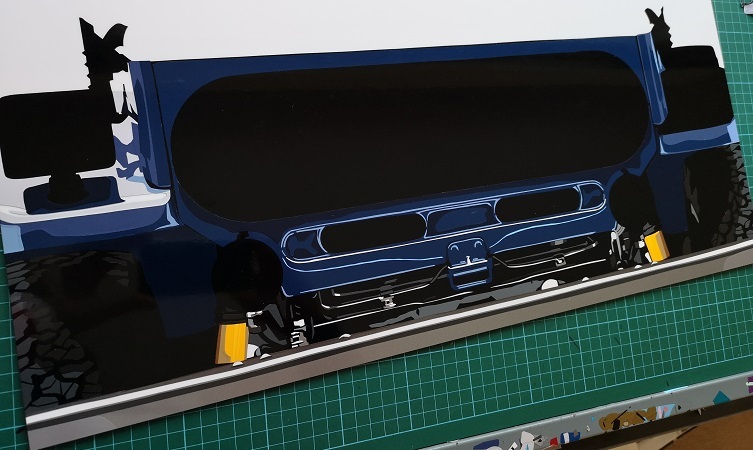 How long does it take to create a hand-cut vinyl piece? Joel: “The Land Cruiser FJ40 is A2-sized and has taken me between eight and ten days. That is quite small and it is a challenge to go any smaller because of the amount of detail in the work. You can’t physically cut the vinyl any thinner without it splitting, stretching or snapping. But with the three-dimensional pieces based on car bodywork, there is no real issue with scaling upwards. 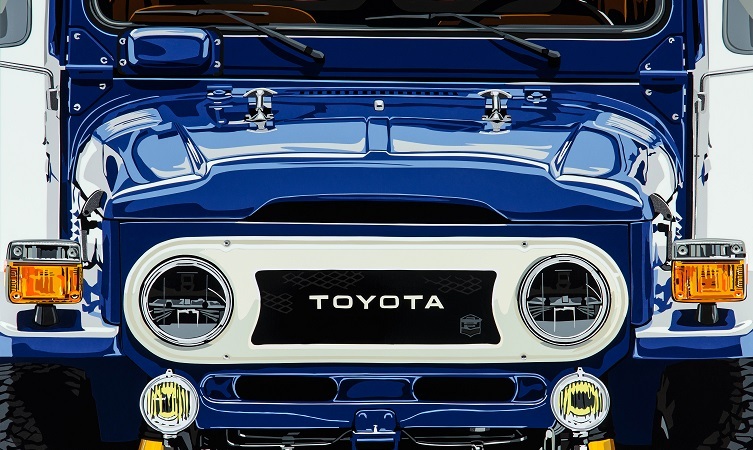 Why do you think the FJ40 art turned out so well? Joel: “I get commissions for all sorts of classic cars and supercars, but this thing is just stunning. 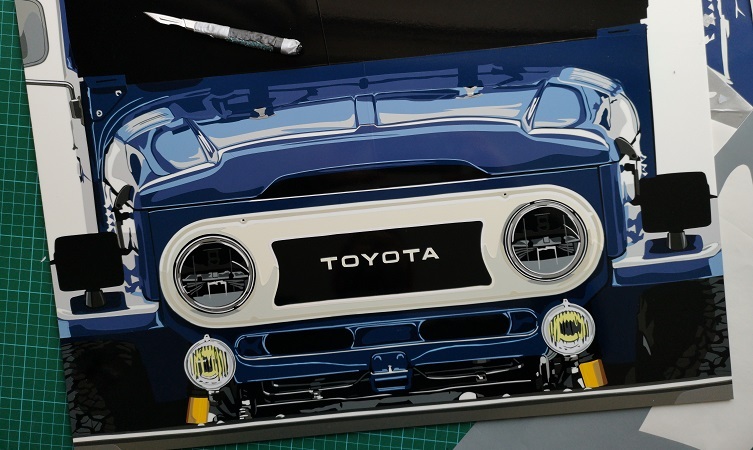 It is based on an image of an FJ Company restoration, and what was really great was being able to see the fantastic photographs the FJ Company itself had done of the car in a studio, where the lighting was absolutely perfect.